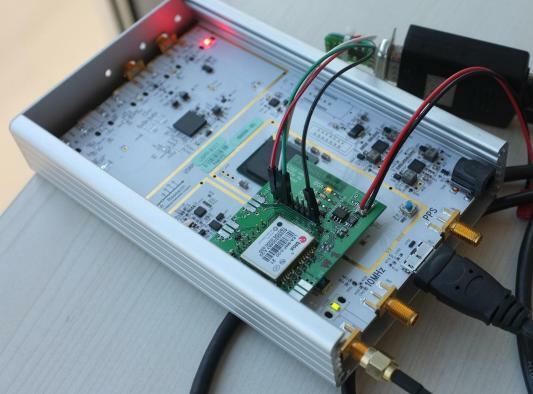 We have developed a small PCB with a u-blox LEA-M8F GPSDO that fits on the USRP B200 and enables the use of the LEA-M8F as a time and frequency reference. The board includes footprints for side-mounted SMA connectors and can also be used independently, powered by USB. The UART, USB and I2C interfaces to the LEA-M8F are available on the board. First version of the ODR LEA-M8F GPSDO board, with external 5V power. The USB micro connector is missing. 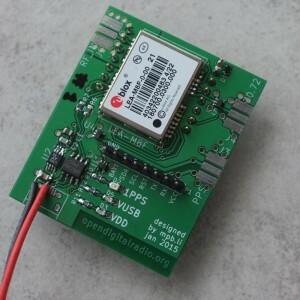 The board is compatible with the B200. Here the UART debugging port is attached to a level-shifter. The board has been designed with the latest KiCAD build, and the design files are available on Github and are released under a CC-BY-SA licence. This board is compatible with ODR-DabMod combined with the USRP B200, but it requires a customised version of UHD available here. The u-blox LEA-M8F can be bought on the u-blox webshop. All other components are available on Farnell, a BOM is available here.